The W-APE is our central transmitting station for wireless DMX. You can use the W-Ape also as a receiver and with two devices you can send a DMX-Signal to all the products that work with DMX512. 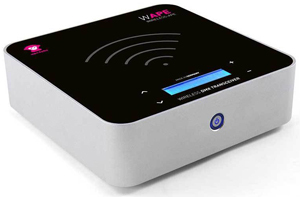 Use the W-APE to send wireless DMX to all ape labs products produced since 2014. Also you can use W-APE to program our products with no display (Apelight and Light Can) a DMX address or define the DMX mode on each device. The W-APE comes with an intelligent microphone. Place the W-APE at a spot to pick up the beat of the music and the W-APE sends a central signal to all of your ape labs products produced since 2014 and controls these synchronized to the beat.